It is a mistake to set up a false choice between network and organisation; instead we should recognise that each has their strengths and weaknesses. On Tuesday, Aaron Peters argued in an article on Left Foot Forward that anti-cuts networks are more flexible and effective than big organisations. He is certainly right to see the student mobilisation of recent weeks as something rather new. The turn out on the original NUS-UCU demonstration was much bigger than anticipated, and the follow up events – which clearly have not finished yet – have taken many by surprise. As Head of Campaigns at the TUC I might be expected to argue the opposite. But I don’t. Aaron’s mistake is to set up a false choice between network and organisation. Instead we should recognise that each has their strengths and weaknesses. Rather than setting them against each other, those who want to see effective campaigning against the economic policies of the government should instead be working out how to make them fit together. Social networking tools make it possible to organise events extremely rapidly and for informal leaderships to emerge. The left has no monopoly as this is how the Tea Party works and has allowed the English Defence League to replace the BNP as the main form of the far-right in the UK. Aaron is also right that big organisations can be slow and cumbersome. But they also have their advantages too. It may take time to build a consensus among, and between, traditional organisations but that can provide the continuity and long-term commitment that is the very antithesis of the flashmob. Loose networks find it much harder to think strategically, plan for the future and deploy resources. They do not have the resilience of big organisations, and are much less able to recover from the inevitable setbacks that all campaigns suffer. Perhaps an even more interesting question about the events of the last few weeks is why it has only happened in education. The same type of campaign has not developed around every coalition cut. One that makes me particularly angry is the 10 per cent cut in housing benefit for anyone who has been unemployed for more than a year. But it has needed organisations to research the issue and speak up against this particularly nasty cut. Indeed the coalition are learning that they can cut benefits for poor people relatively easily – and are therefore switching cuts from public services and public sector jobs to the welfare budget. Aaron singles out the social media campaigns against tax avoidance by companies such as Vodafone and the Arcadia group, but the campaign against the tax gap was launched by the stuffy old TUC. That is not to knock any campaign. We should all welcome partial victories as signs that we can shift the government. But the ultimate objective has to be a different economic policy based on growth and fair tax. That will require a far more strategic and sustained campaign. The cuts campaign is already taking many forms. Despite a minority of counter-productive tactics, the vast majority can all be seen as contributing to a wider movement. Anyone who sets themselves up to lead it and impose any one particular approach will fail. So the real issue is how to get the spontaneous to work with the more traditional. One of the TUC’s contributions has been to help establish and fund the new website False Economy. This provides a space not just for all kinds of campaigners to work together, but for anyone affected by the cuts to tell their story and get involved at a level with which they are happy. So Aaron is right to say that new networks are more flexible than what went before. But it’s far too soon to say that they are so effective – not just in mobilising, but securing campaign victories – that we can stop doing anything else than tuning into Twitter. Nigel is right, both are good, necessary and complementary. In particular, the TUC’s funding of the website False Economy could not be done without a big organisation but could be incredibly helpful to a more flexible network. 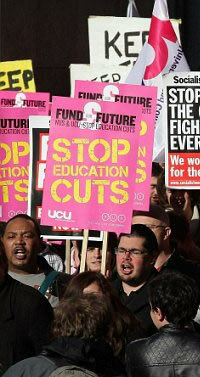 Perhaps the TUC could actually begin their campaign against the cuts now, rather than waiting until March. It may be the case that if tuition fee rises pass through parliament next week the student movement may face demoralisation and a loss of momentum. If the unions actually got a grip and supported the campaign on the ground now, I suspect the movement may have a greater chance of long term survival. It seems that the TUC will instead head onto the streets 4 months after the party only to wonder where everyone went. Response to Pete Kennedy: I realise there’s probably nothing that could be said that would persuade you, but the suggestion that the TUC has not been campaigning against the cuts for months is laughable. What you’re complaining about is that we have decided to have our major public demonstration on 26 March, but (a) that’s confusing “campaign” with “demo”, (b) it’s getting things the wrong way round – campaigns don’t START with national demo’s (not least because they take organising); and (c) actually we did hold a national demo on a similar theme much closer to the start of the global financial crisis, the Put People First demo ahead of the G20 London Summit in April 2009. Since then we have helped found the Robin Hood Tax campaign which now has nearly a quarter of a million individual supporters and the global reach to persuade the European Parliament to support the proposal and persuaded the IMF to switch from outright opposition to grudging acceptance (neither is enough, but the campaign is really only about to hit its stride). We started campaigning against the cuts under Labour, eg the work Nigel references on the tax gap, and the arguments against even Labour’s much less harmful cuts plan which made the TUC 2009 Congress front page news – not least because at that stage we were about the only national public voice against the cuts. Since the election we have been making the arguments publicly (see the widely read Cutswatch section of the TUC Touchstone blog) and promoted local union action across the country, demos outside the Lib Dem Party Conference in September, a mass rally and lobby of Parliament in October just ahead of the Comprehensive Spending Review, and regional demos in October, November and December. But I suppose you’re right, we really must get around to doing something…. Whether an organization or network, the people fighting these cuts must be all in this together.